The national park Jotunheimen surrounds us on all sides. 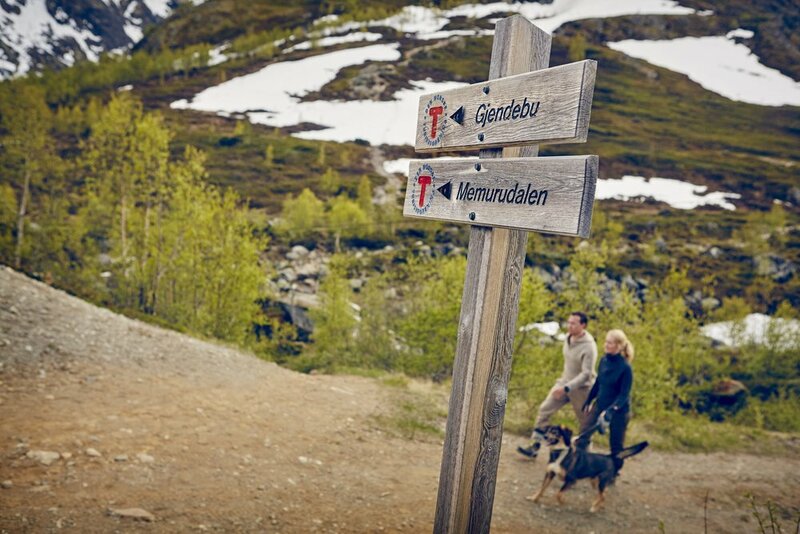 The park covers an area of 2750 square meters, and you will find most of Norway’s 268 peaks over 2000 meters here. The peaks are spread across the entire area, providing excellent possibilities for peak tours from many different starting positions. Jotunheimen does not have any large glaciers, but plenty of small and medium sized glaciers. Smørstabbreen is the largest one, at approx. 14 square meters. Other larger glaciers in Jotunheimen are Vestre Memurubre, Veobreen and the glaciers in the area between Leirdalen and Visdalen. The distinctive Kyrkja (2032 m) at Leirvassbu is a sort of topographical centre in Jotunheimen. Here you will find the eastern/western watershed with four grand valleys in each direction. Leirdalen to the north, Gravdalen to the west, Storådalen to the south and Visdalen to the east/north. The domesticated reindeer is the most common four-legged inhabitant, and they often seek shelter from insects in snowdrifts on hot summer days. There are numerous hiking alternatives in Jotunheimen for all ages, and you meet all sorts of people on your way through the national park. You can meet foreign tourists with handbags and umbrellas on the easiest and most common routes, seasoned mountain tourists staying in a lodge and enjoying day trips, gangs of friends walking from lodge to lodge, glacier walking groups who seek out places others find it wise to steer clear and peak enthusiasts who assemble off the beaten track and are ready for new climbing challenges the next day. Jotunheimen first became a national park through the royal decree of 5 December 1980. The most famous hike in Jotunheimen is the hike over Besseggen.